as the volume decreases between the turning mated rotors. Compression is completed as the air is passed out of the discharge end of the twin-bore cylinder. The process is continuous as long as the rotors turn; thus we have an extremely smooth flow of compressed air. As with the vane type of unit, compressor oil is injected into the twin-bore cylinder and picked up by the mating rotors. The oil serves to seal the rotor surfaces and to cool the air in its compression stages. The oil that mixes with the air during compression is passed into a receiver separator where it is removed and returned to the oil sump. Air compressors consist of basic systems and components such as the air filter, the air control system, the compressing element, and the air receiver and lubrication systems. Other components are safety devices, cooling systems, and air/oil separators. These systems and components allow the air compressor to perform its design function efficiently and safely. The following sections detail the purpose of these different components and systems, and their relationship to efficient air compression. Air compressors have automatic safety control devices that shut the unit down in the event of a mechanical malfunction. Figure 8-9. 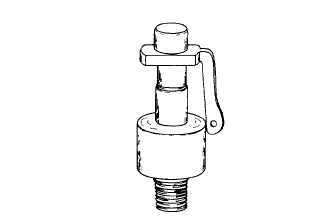 - Typical pressure release valve. Safety devices on air compression systems are not to be bypassed FOR ANY REASON. Engine overspeeding, overheating, low oil pressure, and low or high fuel pressure are all reasons for the prime mover to be shut down. These safety devices are placed on the power source to protect it. Figure 8-8. - Example of airflow through a screw type of air compressor.